It’s no surprise that Julie and I are big Harry Potter fans. When we moved in together last year, there was no argument, we were both bringing our collection of the books. 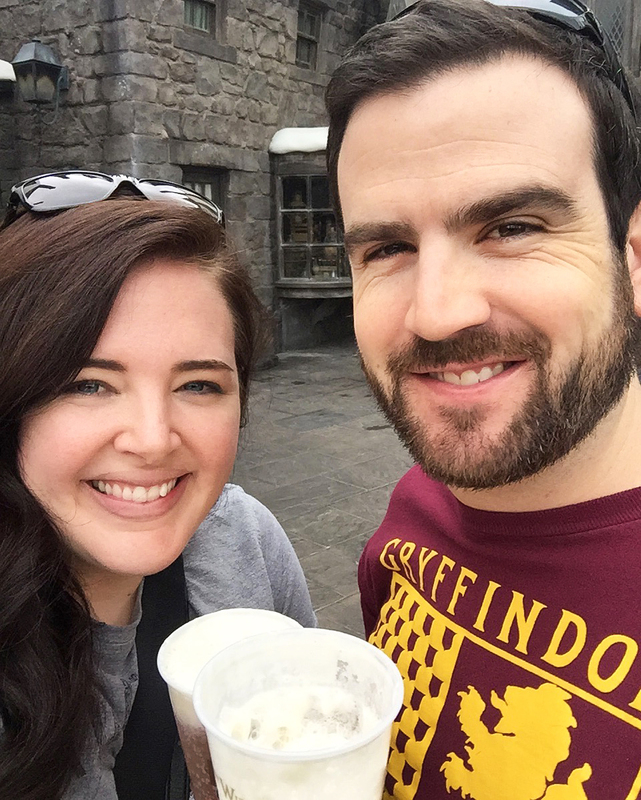 Before I met Julie, she visited the Wizarding World of Harry Potter in Orlando, which I remain jealous of to this day. 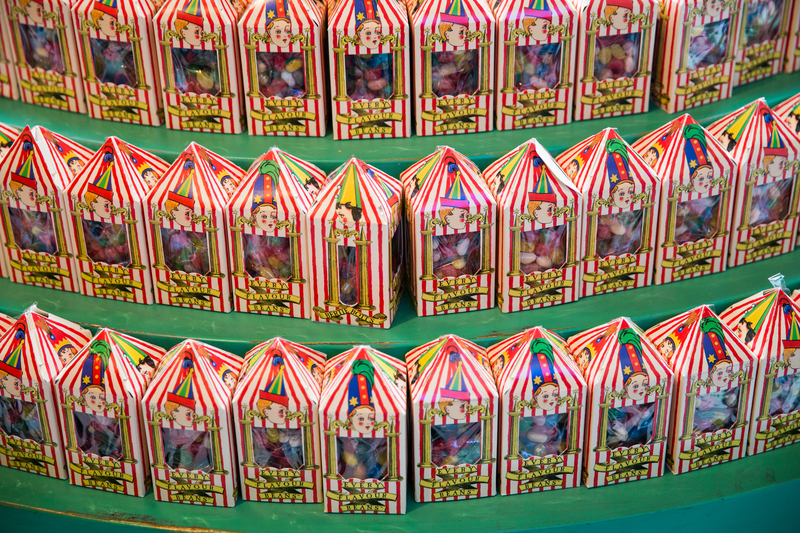 Together, we had an amazing adventure last year at the Warner Brothers Studio Tour Making of Harry Potter experience. 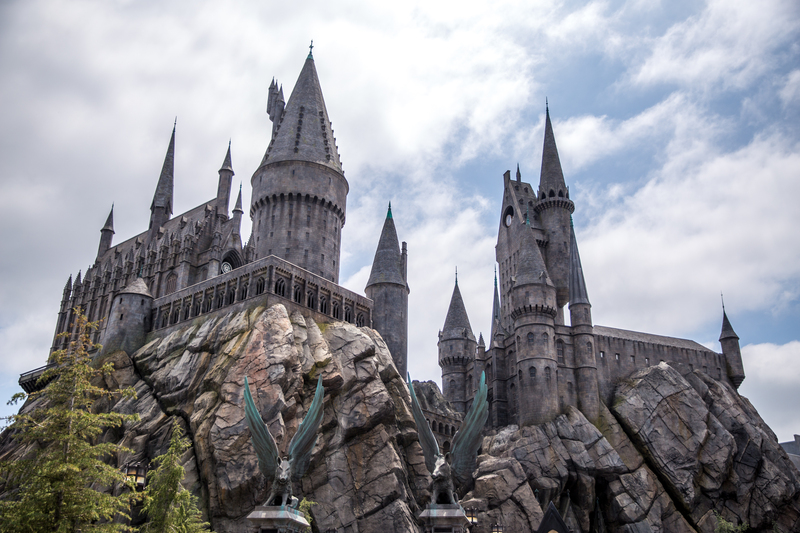 So, as Southern California residents, we have been eagerly awaiting the opening of Hollywood’s version of the Wizarding World of Harry Potter. With only a short time remaining before the busy summer season, we decided to make our visit this past Memorial Day. To save time and money, tickets can be purchased online, which we did prior to heading to the park. 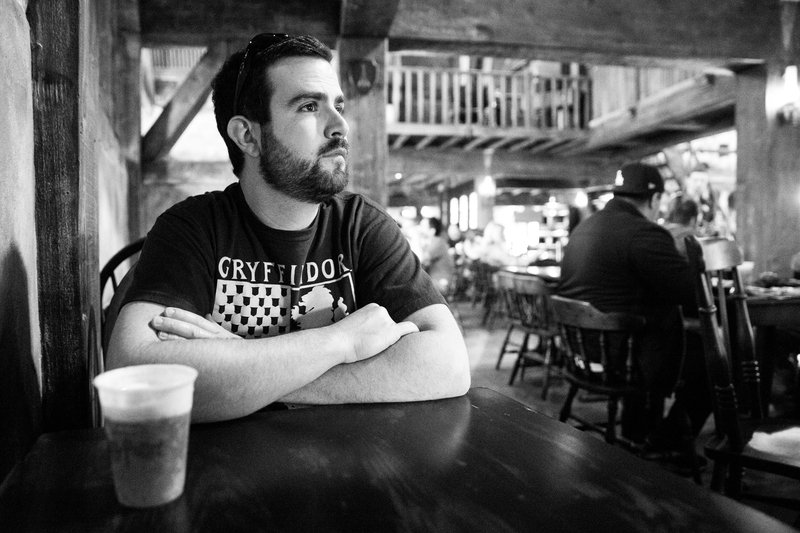 I probably hadn’t been to Universal Studios in about ten years, but I definitely remember they were not $95 a person. If you live locally, or even if you plan to go only twice, it makes sense to invest in a season pass. Julie and I purchased the 2016 Season Pass Plus, which includes fourteen weekend days for $139 (a $10 savings versus at the gate). While this isn’t ideal, we’ll probably go once more before our passes expire in early December, making it a worthwhile investment. On the day of our visit, we opted to get up early and arrive as the park opens at 8:00 a.m. with the hope that the park would not be as crowded. The park typically opens at 9:00 a.m., but they offer early admission if you buy your ticket online from their website. Considering that it was a holiday, the freeways were empty (a very rare occurrence!) and we made it to Hollywood in under an hour . 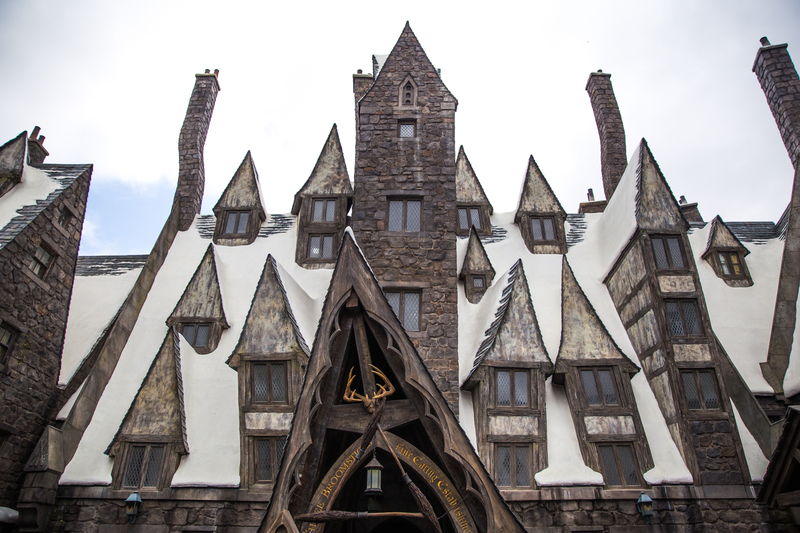 Universal offers a variety of parking options which are detailed more here. We opted for General Admission which is $18 and gives you a quarter mile stroll through the City Walk, which has a plethora of shops and restaurants. 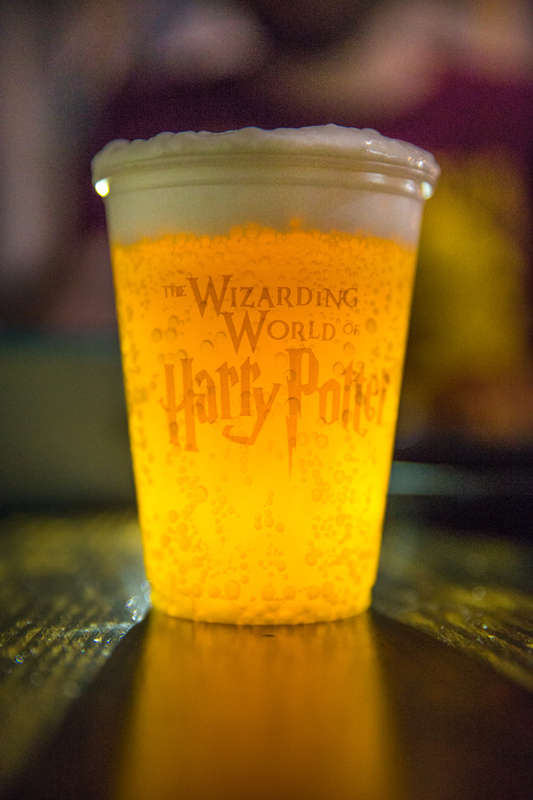 Once through security and the gate, we made our way straight to Harry Potter World, along with everyone else around us. 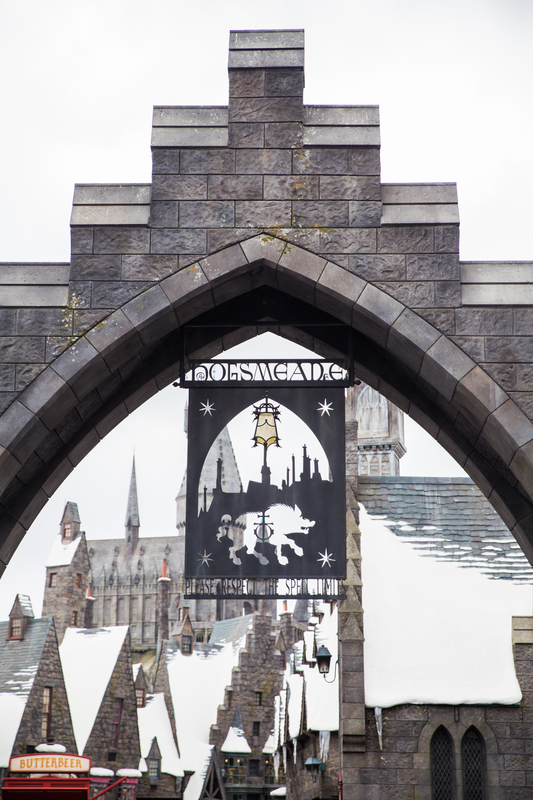 Coming around the corner, the sign for Hogsmeade comes quickly into view, which almost perfectly frames Hogwarts castle in the distance. 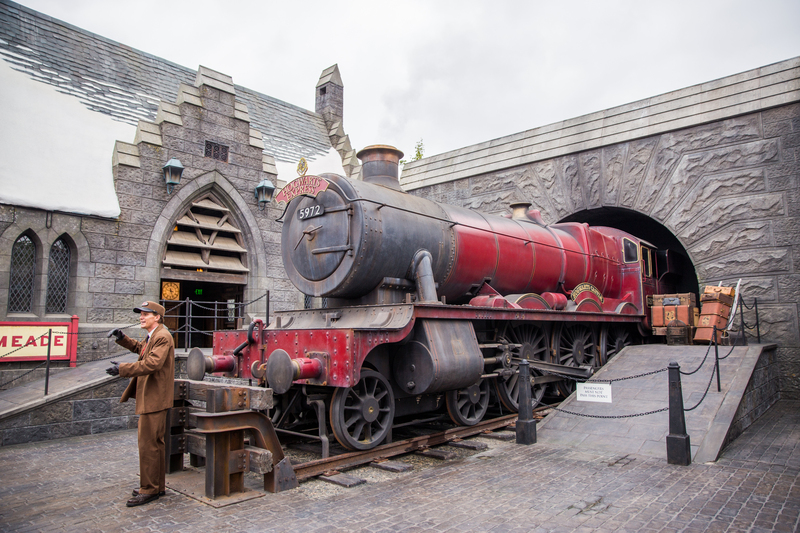 On your immediate right is a replica of the Hogwarts Express and a conductor, who everyone was eager to take photos with. It’s hard not to judge the train against its counterpart in London (the complete film version), but it’s still a treat to see the red engine. 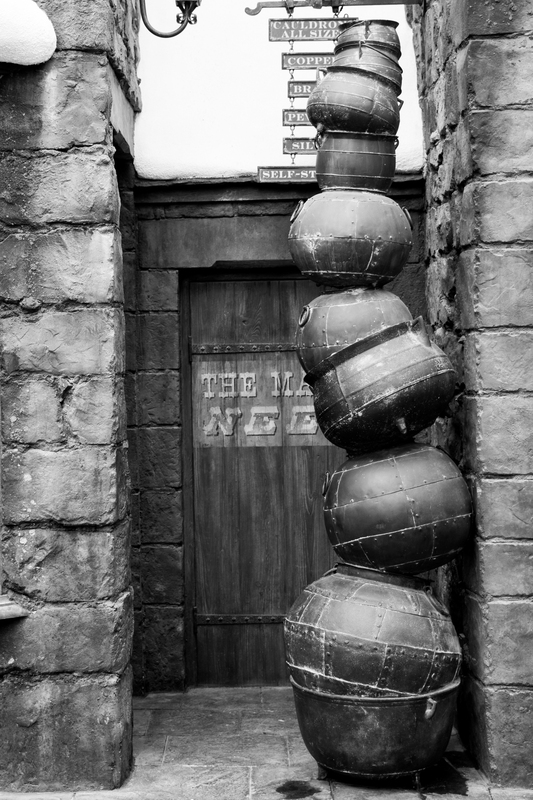 Taking a quick glance at the Hog’s Head and Zonkos, we instead pushed ahead to get in line at Hogwarts Castle for Harry Potter and the Forbidden Journey. My initial thoughts were that the castle looks fantastic! They did a great job of replicating the castle from the films, and I only wish we had more time to admire it as the line moved quickly inside. 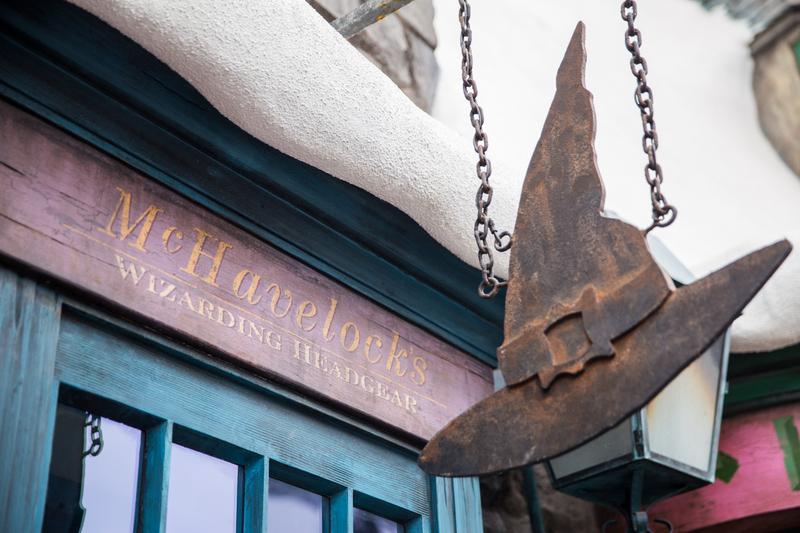 Once you enter the castle, you will be asked to store any larger items (purse, camera, backpack, etc…) in one of the lockers. Be prepared for crowds of people as they hurriedly operate the self service lockers and proceed to the ride. As you walk through the castle, you pass through a room with Harry, Ron, and Hermoine speaking to you before entering Dumbledore’s office. 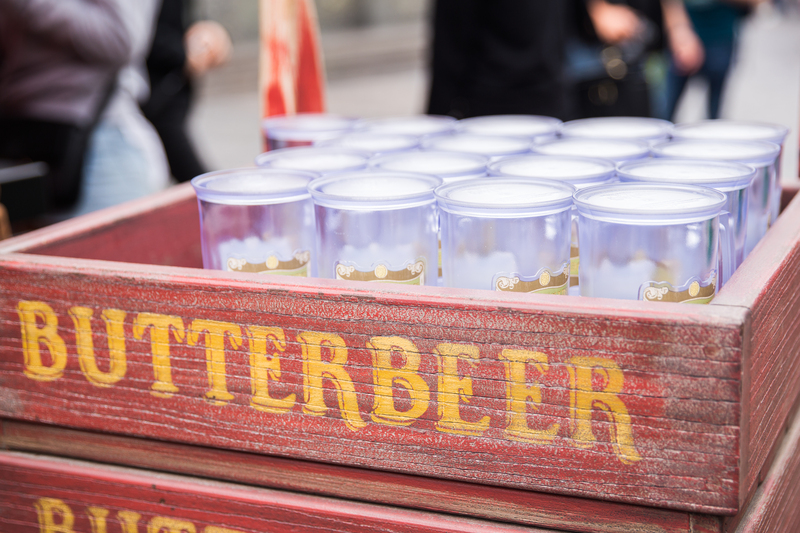 The attention to detail is pretty incredible and really makes you feel as though you were at Hogwarts. For the ride itself, you sit four across and are secured in as you would be in a roller coaster with loops. Before departing, we were handed 3D glasses in preparation for what was to come. Warning: If you get motion sick like I do (Julie doesn’t) be sure to prepare yourself in advance as the ride will definitely make you sick. 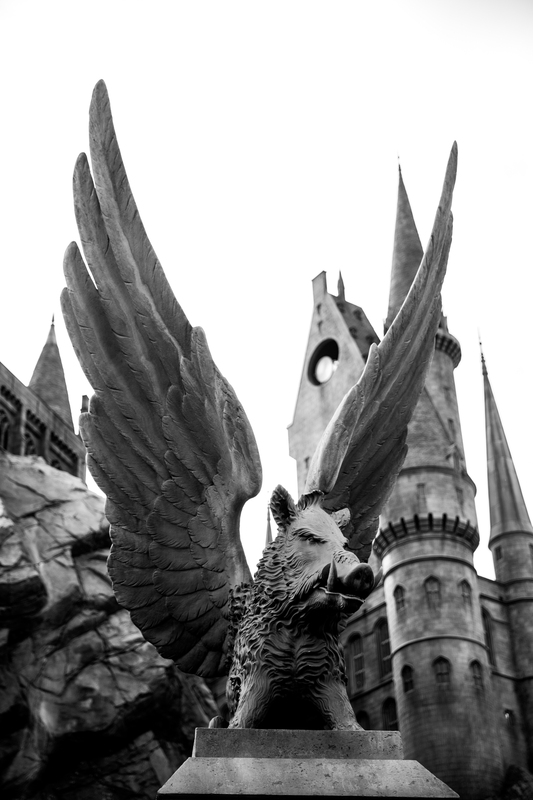 With that said, it’s a unique ride and a fun experience to be flying along on a broom with Harry Potter. Don’t forget to grab the items you stored in the locker on your way out, which will undoubtedly be even more crowded as it was for us. 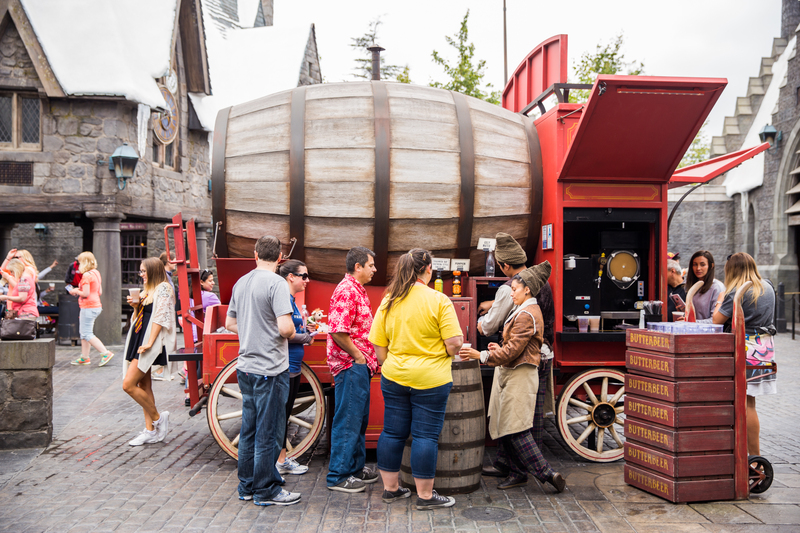 You will also have an opportunity to do some shopping before you exit, as the ride opens up to Filch’s Emporium of Confiscated Goods, which includes a wide variety of clothes, replicas, and other memorabilia. 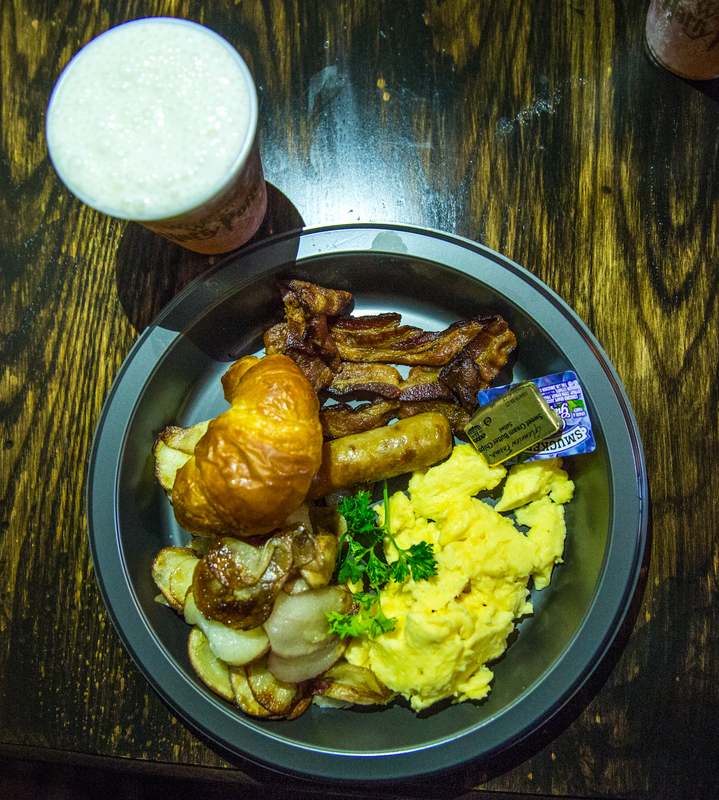 Since it was still pretty early in the morning, we decided to try out the Three Broomsticks for breakfast. While their menu is short, the breakfast options were reasonably priced and looked good. The restaurant is semi-fast food as you order at one counter and pick up your food at another. 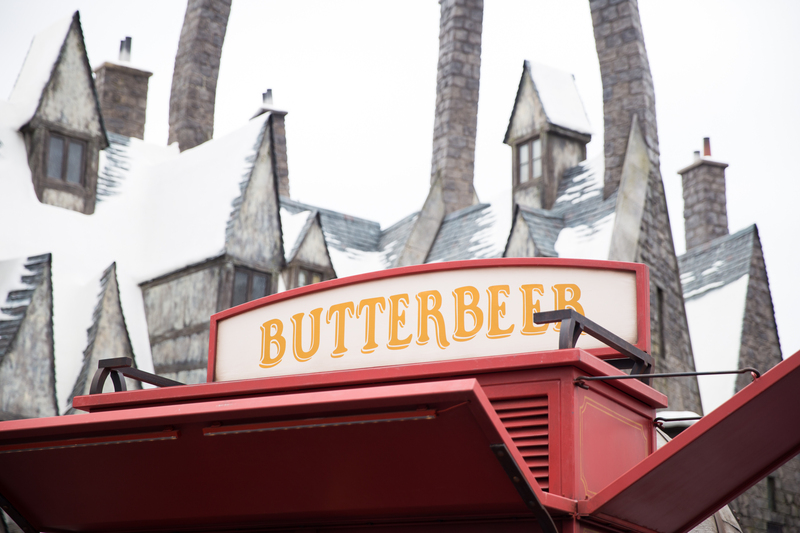 With breakfast, we both opted for Butterbeer as our beverage selection and it was pretty good (though better in London). It basically tastes like a cream soda with a whipped marshmallow topping. 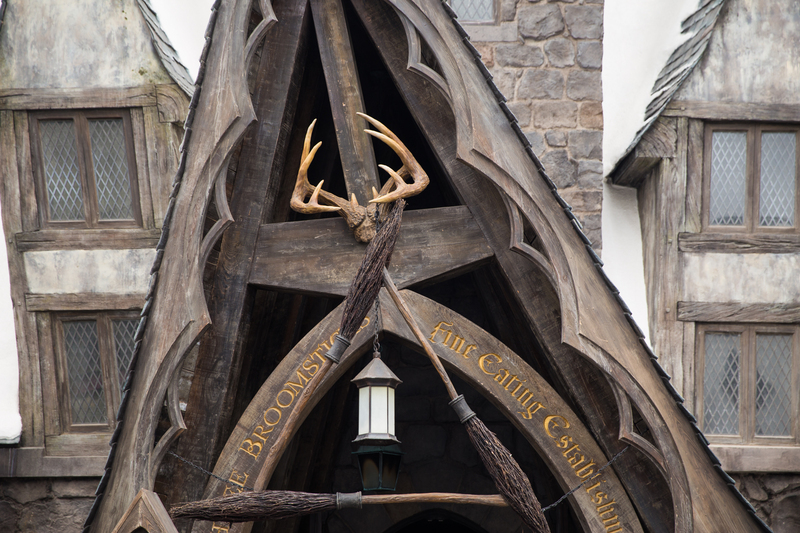 Inside, the Three Broomsticks looks much like you would expect, and the attention to detail is excellent here as well. Our American Breakfast was surprisingly quite good for theme park food, and we left satisfied. 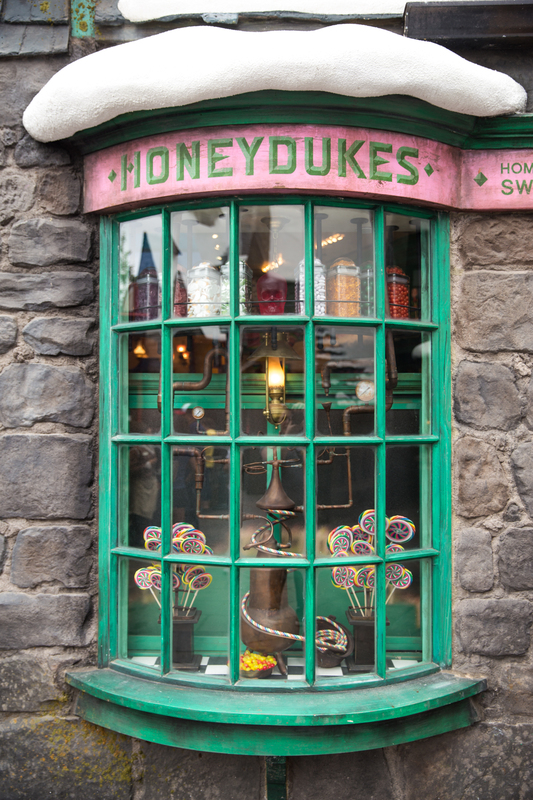 Walking through Hogsmeade you’ll find a number of familiar stores to browse. Keep in mind that these shops are on the smaller side and tend to get crowded rather quickly. 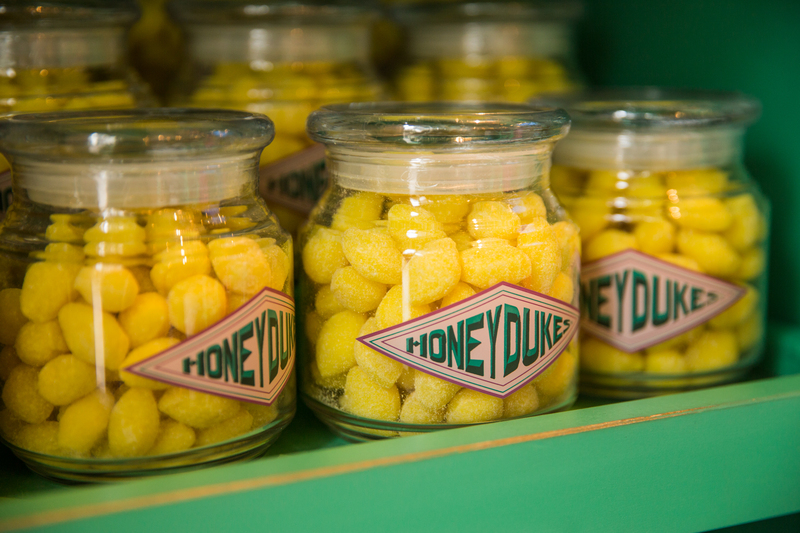 A small nook in the back of Honeydukes is where you will find Zonko’s Joke Shop. 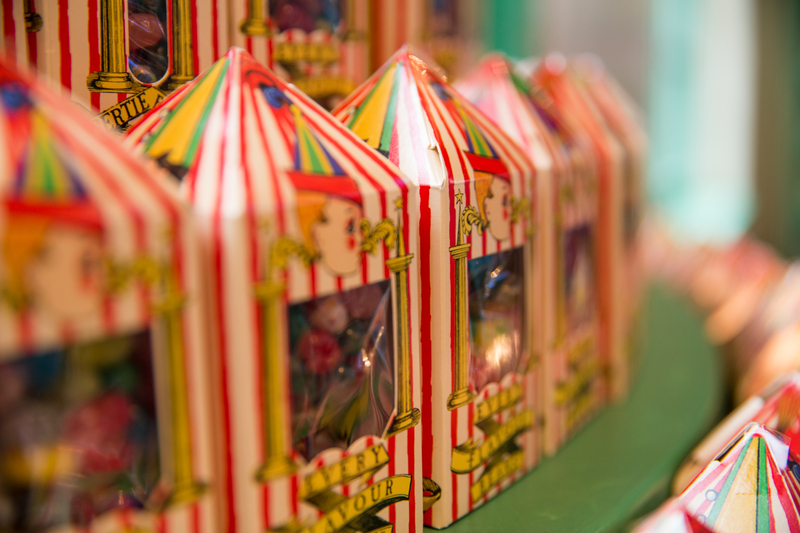 Small, novelty items abound, including a few from the movies like the Extendable Ears. 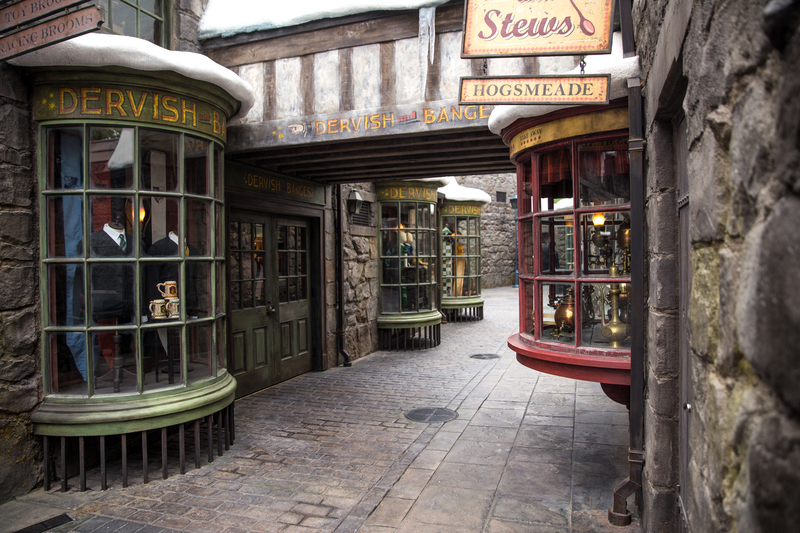 For a selection of Hogwarts’ uniforms and Quidditch equipment, head to Dervish and Banges before picking up your owl at the Owl Post. 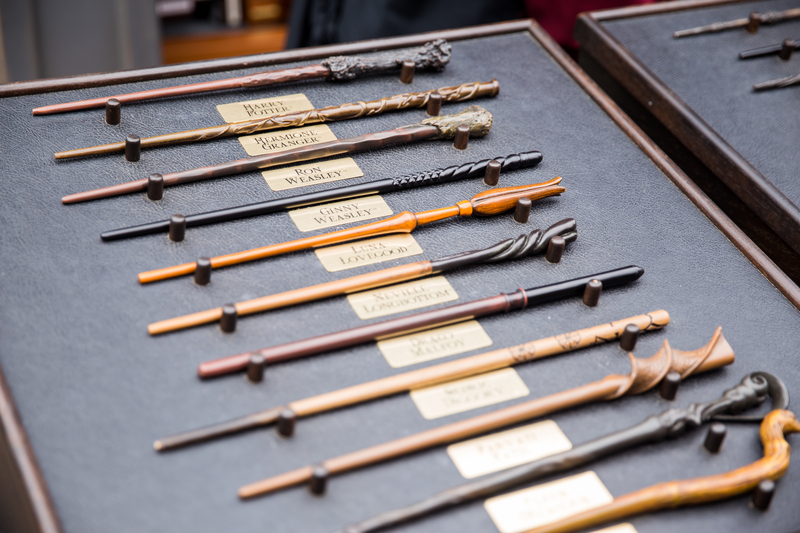 No wizard is ready for Hogwarts until they are outfitted with a wand. 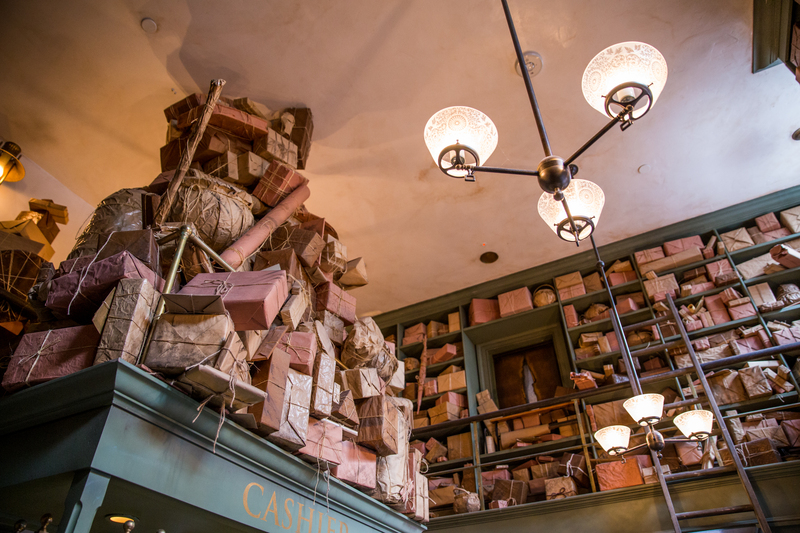 However, Ollivander’s wand shop had a HUGE line! 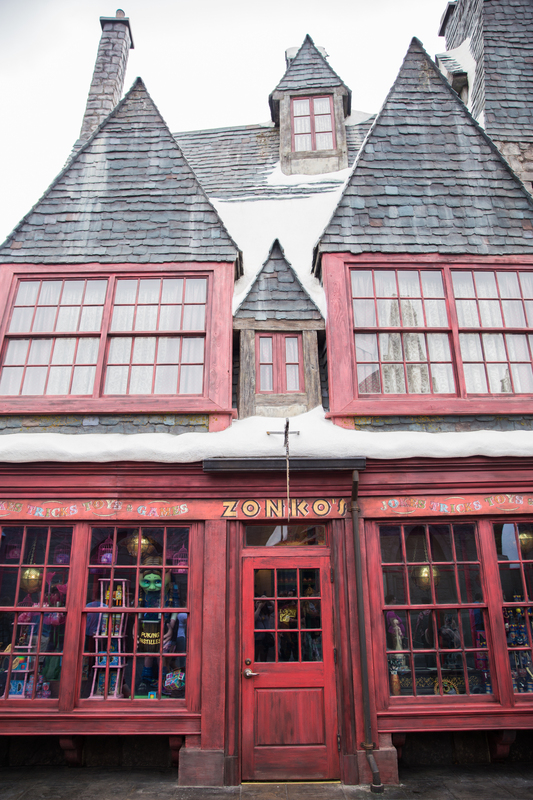 Part of the reason is only a small group of people are let in at a time to see a quick show where one lucky kid gets “chosen” by their wand, before being allowed through to the wand shop. Julie had already waited to do this in Florida, and thought it was not worth the wait on this particular trip. 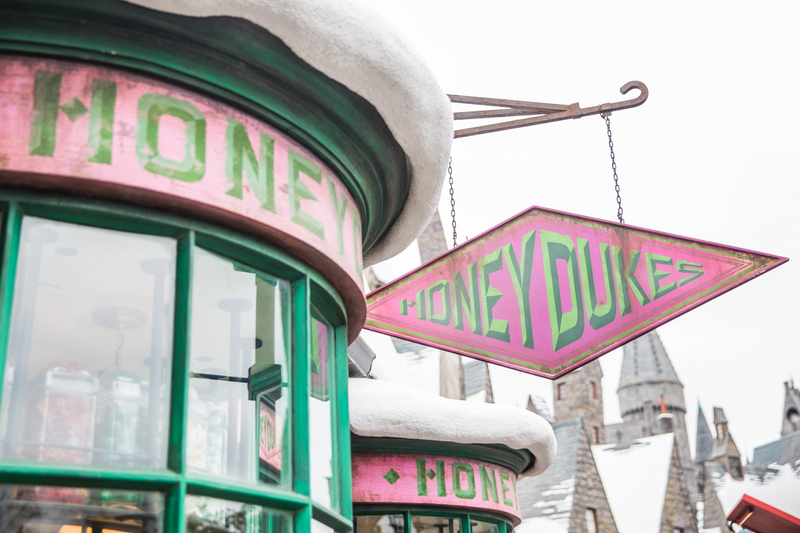 If you do want to purchase a wand, they are sold in several other locations within the park. 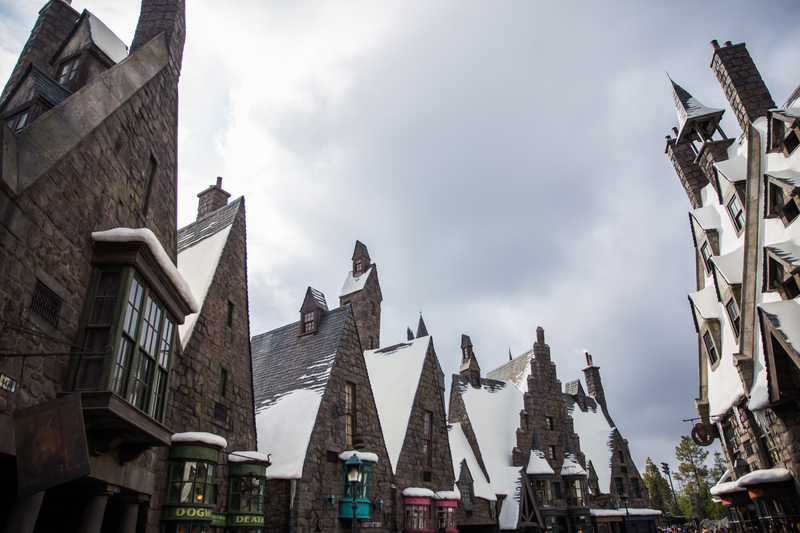 If you’re a fan of Harry Potter, I have no doubt that you will enjoy a visit to Harry Potter Studios in Hollywood. It’s always nice to be able to escape into the world of our favorite witches and wizards, even if only for a short while. 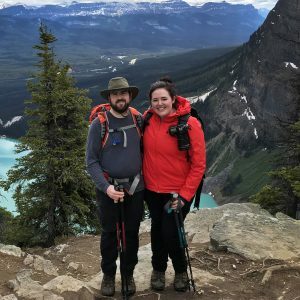 Do keep in mind that the area isn’t large, so you can easily see things in just a few short hours, particularly if you arrive early as we did. 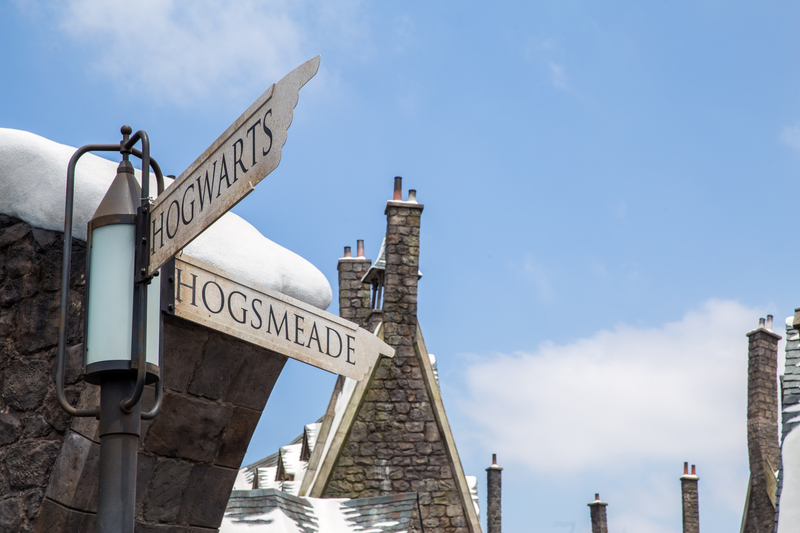 But there are plenty of things to do at Universal Studios and we look forward to our next visit to experience more of what they have to offer. 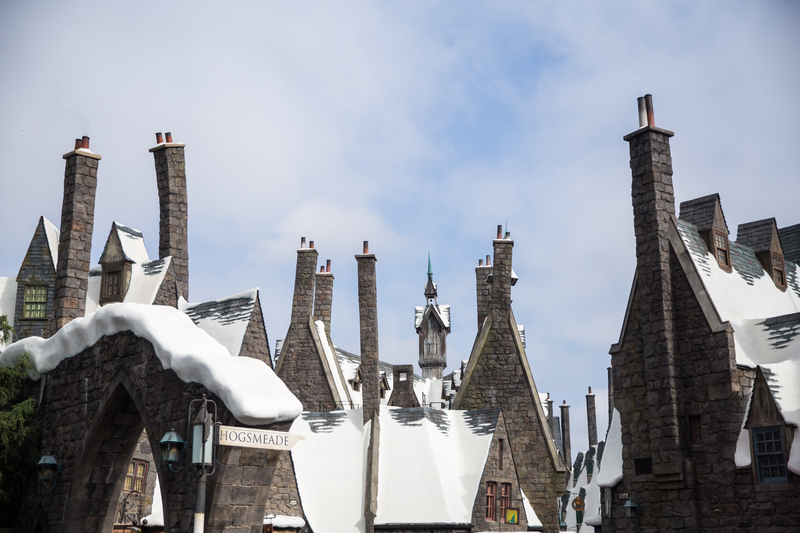 I am also looking forward to eventually getting the chance to visit the Wizarding World of Harry Potter in Orlando.